Start & Finish Lines: Capitol Square – Mifflin St. & Wisconsin Ave.
*Please note that this is the 2018 course. The 2019 course will be posted once finalized and permitted. The course may change at anytime. Significant course changes will be announced. **MapMyRun course is not exact distance and is only provided for turn-by-turn and elevation information. We offer runner tracking for family and friends who are spectating. Let your friends and family know where you are! 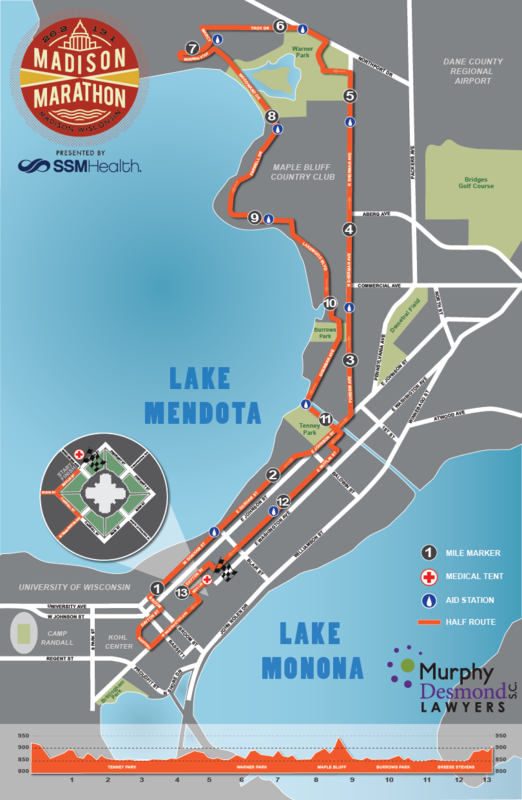 Download the Madison Marathon EventApp powered by Murphy Desmond Lawyers SC for real-time tracking and results on an interactive map! You’ll also find event information, event photo frames to share and more! After downloading the app, elect “Madison Marathon” and press the “Live Tracking” icon to add your favorite participants. You’ll need to log-in with Facebook or create an account. Choose “Notify Me” to receive push notifications for that participant. Be sure to allow the app to provide you with notifications. You can read more about registration changes here.